We’re taking poetic celebrations beyond poetry month and well into May when Proyecto Latina welcomes Chicago poet Johanny Vázquez Paz as our next feature. Spring is in the air and we are excited to have Johanny sharing her humor, wit, and work with us. Join us Monday, May 18th @ 7 p.m. Held at Radio Arte, 1401 W. 18th St. Free. As always open mic and chisme box will be ready for contributors. Johanny Vázquez Paz was born and raised in San Juan, Puerto Rico. She holds a Master of Arts in Hispanic Studies from the University of Illinois at Chicago and a Bachelor of Arts in Sociology from Indiana State University. Her book Poemas callejeros / Streetwise Poems was recently published by Mayapple Press (Michigan, 2007). She co-edited the anthology Between the Heart and the Land / Entre el corazón y la tierra: Latina Poets in the Midwest (MARCH/Abrazo Press, 2001) and was included in the compilation Poetas sin tregua (Spain, 2006) of Puerto Rican poets from the 80′s generation. 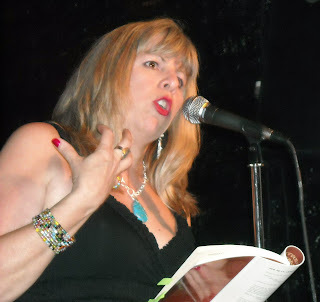 Some of her poems appeared in the anthology Más allá de las fronteras (Ediciones Nuevo Espacio, New Jersey, 2004), and she was published in the collection Carpetas de Luz after winning the Voces Selectas 2000 poetry contest of Luz Bilingual Publishing. Johanny has been published in the literary magazines VOCES Journal (Univ. of California), El Centro Journal of the Center for Puerto Rican Studies (Hunter College, N.Y.), Beyond Borders (De Paul Univ.) and Yagrumal (Puerto Rico), among others. She has also participated in many poetry readings at universities in the Midwest, and is currently the emcee of the Guild Complex Bilingual Series’ Palabra Pura. She currently teaches Spanish at Harold Washington College in Chicago, IL The author invites everyone to her blog Tinta Derramada.